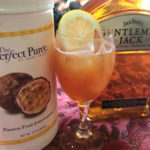 Jonathan Pogash, The Cocktail Guru, Inc. Shake ingredients very well with ice and strain into cocktail glass. Garnish with Luxardo cherry and lemon wheel.